How Can You Avoid Plumbing Clogs? Has your water heater started to show signs of failure? Perhaps your tank water heater isn’t providing you with hot water as long as it used to during the day, or the water isn’t hot enough. Maybe you’re seeing discoloration in your hot water taps, indicative of a system that’s started succumbing to rust. Before you rush off and get a new storage tank water heater, we encourage you to learn more about tankless water heaters, and see if this type of installation would benefit you! There are still many homeowners out there who don’t realize that they have this option when it comes to water heater installation. There are actually many options when it comes to water heater systems. Tankless models are subject to a bit of scrutiny, as some homeowners are skeptical of a water heater that can work as well “on demand” rather than relying on a tank full of hot water. Will it end up meeting your needs? Read on to learn more and decide for yourself! We want to be upfront here—the installation of a tankless water heater is going to cost more than a traditional storage tank system. We understand this can cause you to hesitate with this purchase. However, tankless water heaters have the potential to save a considerable amount of money over their lifetimes due to their energy efficiency, thus paying you back the high initial cost long before it has to be retired. The reason for this is because a tankless system doesn’t have to continually heat a container of hot water to keep it at the appropriate temperature for use. Rather, heating coils heat the water on-demand—whenever there is a request form a tap or appliance in your home. This means that your water heater will only run a fraction of the time if it were instead a storage tank model. This results in significant savings. Additionally, tankless systems last longer, giving you an even better return on your investment! But Is a Tankless System Right for Your Home? One benefit of tankless water heaters that is often advertised is that they provide “limitless” hot water. Essentially, you won’t run out of hot water like you will with a storage tank system. 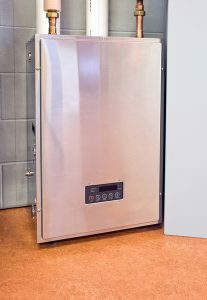 A tankless water heater provides a flow of approximately 3.5 gallons of hot water per minute. This does mean that if a greater gallon demand is placed on the system, it can overwhelm the water heater and result in a drop in efficiency. So if you have multiple appliances running at the same time, and/or someone is taking a shower or using water in some other way, you may see this drop in efficiency. That being said, tankless systems are often the preferred form of water heater for homes that typically don’t have multiple taps running at the same time, like homes with small families. However, it is easy to install more than one tankless water heater for larger homes to make up this difference. Contact IERNA’s Heating & Cooling for expert water heater services throughout Tampa and beyond.